even touched. They must be felt with the heart." "Pat Yaghmourian insightfully writes heartfelt accounts as told from the perspective of her beloved huskies. The simple routines of an ordinary day, spent with our beloved pets are vividly brought to life, revealing the tremendous joy and unconditional love they never fail to bring us. No stone is left unturned as we explore the mind and spirit of the indomitable husky. A light hearted, charming book to be loved by animal lovers both young and old. " I thoroughly enjoyed this book. As a dog lover, I became involved in each Husky�s life and personality, learning about the breed, good, and sometimes, not so good traits. I knew little about Huskies, but now I can appreciate this beautiful breed. It�s a hard-to-put-down book, and yet you don�t have to be a dog lover to appreciate it, although it doesn�t hurt. Woof! 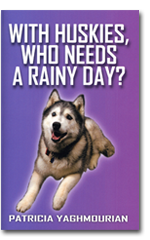 If you are a pet lover, like me, you will enjoy reading 'With Huskies, Who Needs A Rainy Day?'. The book is written from the hearts and minds of the huskies, which is very entertaining. The adventures that these dogs have are fun and you can feel their curiosity. The chapter, 'Phoenix Confronts Old Age' is written with love and great understanding, it is beautiful. In true Husky fashion, their antics and intelligence transport us into the canine world. In With Huskies, Who Needs A Rainy Day?, a reader gets to share the challenges and rewards found in their tour of life, as well as, the close bond that develops in this devoted breed of companion pets. I very much enjoyed reading "The Houses Of My Life'. I could feel the warmth of remembrance from the author. As the years progressed, the family grew with both happiness and sadness, as is the case of so many families. The author lovingly introduced me to her family and I thank her for giving me the opportunity to 'meet' them. I have referred this book to many of my friends, I know they will enjoy it as I have. THE HOUSES OF MY LIFE is a unique approach to chronicling one's life experiences. While it makes the reader reflect on his own past, it also provides the reader an opportunity to experience the author's life' journey with the pain and happiness she found along that journey. Throughout the book, the importance of family is stressed and the joy and comfort that a canine, not only a human being, can bring to a person in despair. In searching for answers to the tragedies that befall the author and her extended family, the author comes to the realization that there just might not be any that make sense or simply do not give rise to more questions, but I felt her strength of character and her hope for the future. She teaches us that you may not get over insufferable losses; rather, you work through them. I�ve been busy writing a monthly book review for the Buckaroo newsletter published by the Desert Caballeros Western Museum in Wickenburg. I�ve also started to research and write my Ireland reflections book and will soon complete Chapter Two - stay tuned for the progress. The title remains a Irish mystery to me and you. In keeping within the book realm, I�m now on the Board of the Friends of the Surprise Libraries as the volunteer coordinator. Our books, DVDs and CDs are all donated. The monies made go to help support Surprise school libraries and needed requests for two Maricopa County libraries in the area � valuable work indeed.